As the name suggest, Debt Mutual Funds invest in different categories of debt securities like Government Bonds, Corporate Bond, Money Market Securities, Treasury Bills of different maturity date and have fixed interest payment. Debt Mutual Funds are categorized into various types like Dynamic Bond Fund, Short Term Debt Fund, GILT Funds etc. Every Debt Mutual Fund carries a credit risk rating assigned by external rating agencies, which indicates the creditworthiness of the borrowers. A fund with AAA credit risk rating implies high safety of capital and less risk volatility and can be compared with FD. 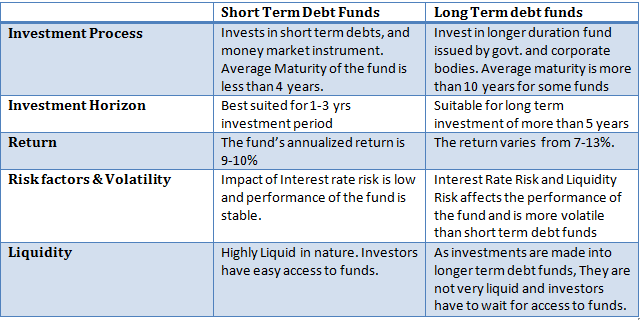 We discuss Short term debt fund vs long term debt fund in detail in this post. Debt Funds are considered liquid securities. It provides the facility of Systematic Withdrawl Plan (SWP) to investors after one year of investment without charging any Exit Load.Investment in debt fund is not affected by volatility in the equity market. It ensures overall stability to your investment portfolio by reducing risk. Debt Mutual Funds generate returns by investing in bonds issued by government & corporate bodies and different money market instrument. Debt Mutual funds primary source of income is interest income from bonds and secondary is capital appreciation. As bonds are traded in the market, the price of the bond rise and fall. Subsequently, there is a chance of making additional money over interest income. There are many factors responsible for the change in the price of a fund. The major factors are, change in interest rate in the economy, upgrade or downgrade of the credit quality of the portfolio. For Example: A bond is issued at an interest rate of 8% p.a. Then interest rate of the economy falls and new bonds are being issued at 7%. Here the value of old bond increases as it will pay more interest on the money invested thus increases the bond price. Mutual funds will get benefited from the increase in the price of the bond, and sell it to make additional profits. The situation can reverse when the interest rate increases. The credit quality is also the main factor in determining the price. The fund with low credit quality will face the risk of volatility and chances of default of these instrument by the issuer are higher thus affecting the credit discipline of the fund. Debt funds don’t offer the scale of return as equity funds, but they are less prone to volatility than equity. Short-term debt funds invest in shorter duration bonds with average maturity of 1-3 yrs which currently gives 9-10% annualized return. The Long-term debt fund invests in longer-term debt securities and outperforms short-term funds with a wider gap of return of 7-13%. For investors, fall in the yield of the bond is more beneficial in longer term debt fund in a falling interest rate economy. Interest rate risk plays an important role in the return of the fund. Short term funds objective is to earn interest income on short- medium term bonds. Interest is added back to the NAV of the fund and gives a steady rate of income. Interest rate least affects the NAV of the fund. As Dynamic bond fund invests in longer duration of fund across different asset class. Interest rate risk is more. In a falling interest rate scenario, the fund will be more in demand thus increasing the price of NAV and in rising interest rate environment opposite happens. The fund can earn interest income and capital appreciation. These funds are more volatile in shorter duration during interest rate change. This happens because, the issuer of debt fund has to pay par value of the bond at maturity whoever owns it, and market value of the bond converges with its par value as maturity approaches and bonds with many years until maturity, conversely gets impacted by rate change. Short term funds don’t invest in longer-term debt securities as they aim for steady returns with less volatility in 1-3 yrs. For the stable return in shorter duration, an investment timeline should match with an average maturity of the fund. Dynamic bond funds have the flexibility of taking advantage of the current bond market yield in its favor. They can have a mix of both shorter duration and longer duration funds or whole longer duration fund in their portfolio to get maximum return from the portfolio. As discussed earlier, short-term debt bonds aim for a steady rate of returns with moderate to less risk. Dynamic bond funds follow an active management style. They adjust their portfolio’s return according to the interest rate risk by buying and selling of longer duration funds simultaneously. The risk of adjusting and ability to gauge the direction of the future bond market increases the volatility of the fund. As both types of funds offer a different investment perspective to investors, they share common basic indicators to measure the fund’s performance. Volatility and return of the funds are both depended on credit risk, interest rate risk maturity period, duration of the debt instruments. A fund’s return can be increased by lowering the credit quality of the portfolio, but at the same time, it increases credit risk. So, it is very important for investors to check the fund’s performance indicators before investing. I think this is an informative post and it is very useful. Thanks a lot for keeping great stuff.